In 2012 two men were lynched in Bolivia, first because there is an illicit market for Bolivian cultural objects, and second because a small, poor community turned to desperate measures to protect themselves from that illicit market due to the failings of national and international regulation. 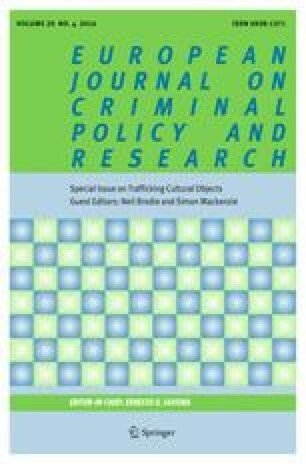 This paper is a case study of the reality of source-end regulation of an international criminal market in a developing country. I will discuss what is known about thefts from Bolivian churches, the international market for items stolen from these churches, and how such thefts are meant to be prevented on-the ground. Following this, I will present lynching in Bolivia as the most severe community response to the issues created by local politics, ineffectual policing, unenforceable laws, and a history of oppressive racism. I will conclude with a discussion of what we can reasonably hope to accomplish with source-end regulation. Almanza Luna, E. (2011). Pobladores entregaron a la Policía a presunto ladron de templos. Reporterow, 19 July. http://reporterow.com/2011-07-19-pobladores-entregaron-a-la-policia-a-presunto-ladron-de-templos--noticia_12411.html. Accessed on 13 June 2013. Aira Gutiérrez, H. A. (2012). Linchamientos en Quila Quila. Correo Del Sur, 8 March. http://www.correodelsur.com/2012/0308/19.php. Accessed on 18 June 2013. ANF. (2000). Identifican otro cuadro robado en domicilio de diplomático peruano es el terecer lienzo boliviano hallado en manos del agregado cultural del Perú. ANF. 24 October. http://www.bolivia.com/cultura/cul001024b.htm. Accessed on 23 November 2012. Art Loss Register. (2011). Seventeenth century colonial paintings recovered. Website of the Art Loss Register. 20 September. http://www.artloss.com/news/seventeenth-century-colonial-paintings-recovered. Accessed on 24 June 2013. Carpineta, L. (2006). La justicia comunitaria es mucho más transparente que la ordinaria. Pagina 12, 9 July. http://www.pagina12.com.ar/diario/elmundo/4-69667-2006-07-09.html. Accessed on 19 June 2013. Ciudadanía & LAPOP. (2012). Cultura política de la democracia en Bolivia, 2012: Hacia la igualdad de oportunidades. Report. http://ciudadaniabolivia.org/index.php/librosdetalle/articles/lapop2012libro.html. Accessed on 18 March 2013. El Diario. (2002). El pedido de extradición de Dominique Scobry fue devuelto a Bolivia. El Diario. January. http://www.eldiario.net/noticias/2002/2002_01/nt020103/6_00clt.html. Accessed on 23 November 2012. El Diario. (2012a). Turba linchó a dos supuestos delincuentes en Quila Quila. El Diario, 8 March. http://www.eldiario.net/noticias/2012/2012_03/nt120308/sociedad.php?n=63. Accessed on 18 June 2013. El Diario. (2012b). Identifican a personas linchadas en Quila Quila. El Diario, 10 March. http://www.eldiario.net/noticias/2012/2012_03/nt120310/sociedad.php?n=62. Accessed on 18 June 2013. El Potosí. (2011). Ladrones acabaron con las joyas de la Virgen de Tinguipaya en 30 años. El Potosí, 8 January. http://www.elpotosi.net/2011/0108/z_1.php. Accessed on 17 June 2013. IAF. (2014). Two perspective on a development experience. making a difference, Note No. 5. http://www.iaf.gov/index.aspx?page=894. Accessed on 18 June 2013. La Razón. (2012). La Justicia en manos de comunidad, La Razon, 30 October. http://www.la-razon.com/suplementos/la_gaceta_juridica/justicia-manos-comunidad_0_1714628604.html. Accessed on 18 June 2013. Los Andes. (2011). Puno: Investigan asalto a iglesia de Pomata y tortura a los cuidantes, Los Andes, 3 January. http://www.losandes.com.pe/Regional/20110103/44915.html. Accessed on 13 June 2013. Los Andes. (2013). Condenan a 22 años por robo sacrílego en templo de Pomata. Los Andes, 6 February. http://www.losandes.com.pe/Policial/20130206/68630.html. Accessed on 13 June 2013. Sánchez, K. (2011). Roban reliquias de iglesia de Pomata, LaRepúblicaa, 5 January. http://www.larepublica.pe/05-01-2011/roban-reliquias-de-iglesia-de-pomata. Accessed on 13 June 2013. Yates, D., Alconini, S., & Erickson, C. (2011). Summary of the Bolivia-United States MoU Extension Hearing. Website of the Archaeological Institute of America, 4 August. http://www.archaeological.org/news/advocacy/6098. Accessed on 24 June 2013.